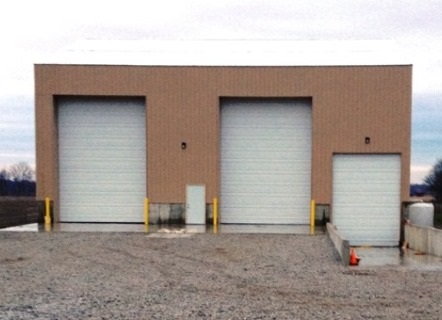 T&S Trash Service had a desire to permit a new waste transfer station at their facility in Waynetown, Indiana. The permitting process required petition submittals to the Indiana Department of Environmental Management (IDEM) for a Municipal Solid Waste Permit as well as Rule 6 for Industrial Stormwater Management Compliance. Our services included project representation at the various government agencies as well as preparing the necessary paperwork as part of the submittals. We prepared the IDEM submittal, completing the different parts of the permit application, by providing narrative sections, such as facility descriptions, procedural operations, safety and emergency response. We also prepared the required sketches and drawings for the submittal. The necessary construction documents for the new waste transfer facility were also generated in our office. These included the building foundation/wall structure, plumbing and electrical systems. As part of the building design, we incorporated a recessed loading pit with steel deflectors as required by IDEM. The necessary site improvement documentation for site surface improvements, grading/drainage and traffic circulation were also created in our office. Ultimately, the Municipal Solid Waste Permit was approved by IDEM in minimal time. T&S Transfer and Recycling has been operating since November 2013. We were happy to be able to provide our services to help yet another client’s dream become reality.